As you all know, there is nothing better than a fresh, sweet blueberry right off bush in the heat of summer. If you want to not only experience that at our farm, but also at home we can help with that! 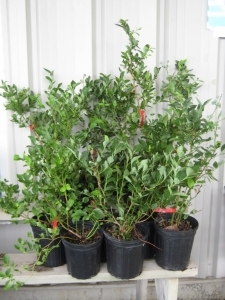 This year we are offering 2 year old, potted blueberry plants for sale. This is the same size plant that we plant at our farm and have had great success with. The picture below shows the size of the plants you’ll receive. With each plant, we will provide you organic sulfur to lower your soil’s pH and organic fertilizer for this year. We’ll also send you instructions on how to plant your blueberry plants and how to care for them throughout the season. The cost is $25 per plant. You can click here to go to our online store to place an order. We are asking for payment at the time you place your order. We’ll get in touch once the plants have arrived at our farm. The plants will be for available for pickup approximately Saturday, May 4th. We’ll also set up a system where the plants are under the roof of our upick building and you can come pick them up when it is convenient for you. We are offering 3 different varieties for sale that we’ve had good success with at our farm and that ripen at different times throughout the summer. Generally you will get more fruit and bigger fruit if you plant at least two different varieties for pollination. Descriptions of the varieties are below. If you have specific questions about varieties or about your site’s suitability for blueberries, feel free to email us (info@littlehillberryfarm.com). Patriot - Patriot is the quintessential blueberry. It’s big and sweet. It normally ripens for us around the 10th of July. It tolerates heavy clay soils better than other blueberry varieties. Although we have not tried this, I have read that Patriot does fairly well if kept in pots. Bluecrop - We didn’t plant Bluecrop as one of our initial varieties when we started the farm. And that was a mistake! Since we started planting Bluecrop in 2014, I’ve been amazed at their vigor. They seem to grow big and fast. The berries grow in nice clusters for picking and taste great. Bluecrop ripens for us around the 17th of July, a week or so after Patriot. Superior - Was developed by the University of Minnesota for our cold climate so is very hardy. It ripens about 5 days after Bluecrop. The berries have a nice balanced flavor. It will be a little shorter than the Patriot and Bluecrop plants reaching a height of 4 feet. It also turns a beautiful red in the Fall to add color to your landscape. Click here to go to our online store to place your order. Spring is here! We’re looking for berry pickers and u-pick staff for this summer. While we primarily tend to employ teenagers, we think helping out at the u-pick would be great fun for those of you who are retired or semi-retired, or just have a little extra time in the summer and like to be outdoors! Feel free to pass on this information to people you know that maybe don’t receive our emails. If you are interested and want more information, please send us an email at info@littlehillberryfarm.com.